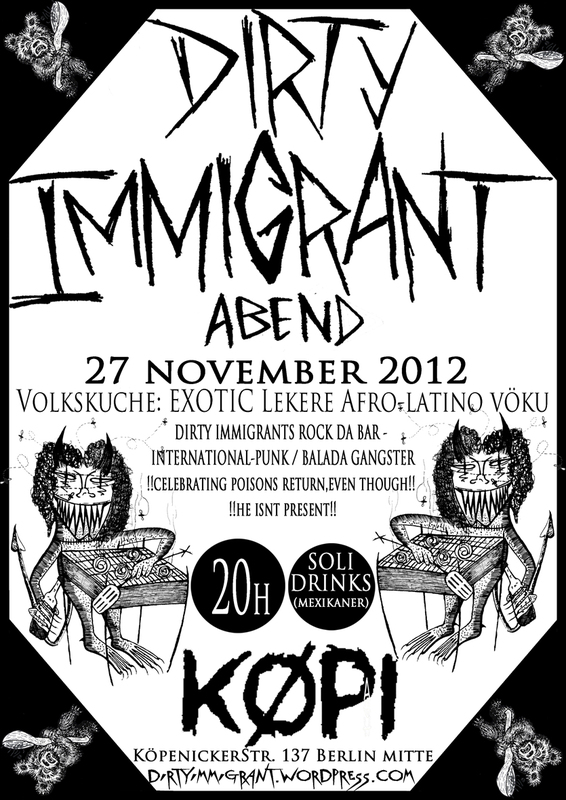 14 October 2014: “Dirty Immigrant Collective” in cooperation with “77-82 Team”, presents: Street Punk concert in Köpi/KomaF, with food for the people. After long time without updating our page/blog. Starting at 19:00 – From 10:30 music in the basement. Bogotá, Kolumbien, Sud-amerika ein Blick auf eine wachsende Szene. 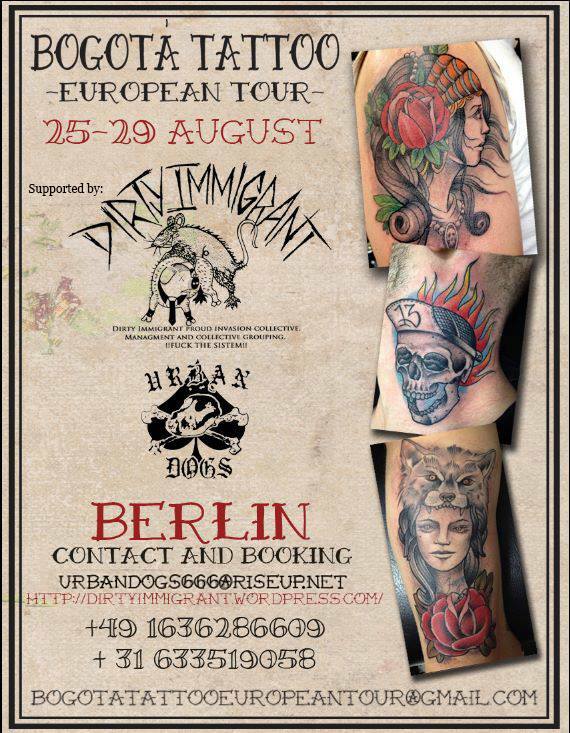 25 – 29 August 2014: Bogota tattoo European tour. 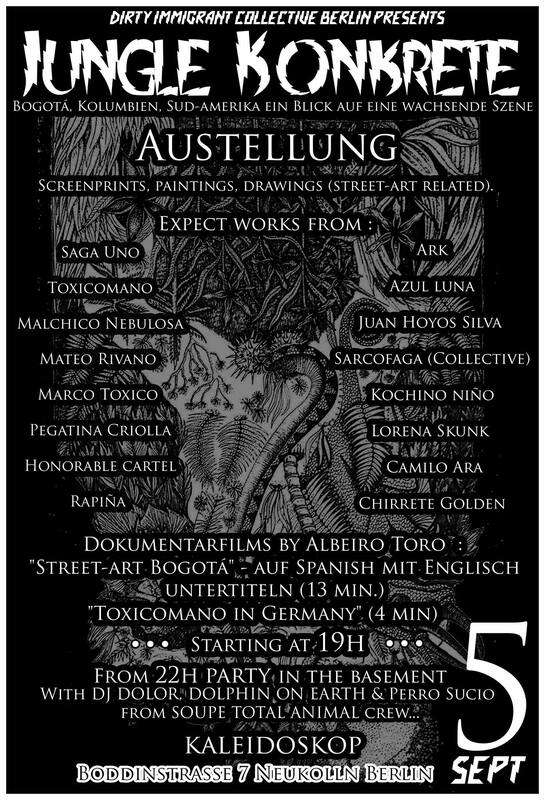 Support booking tattoos in Berlin: One more time “Riverita” (Tattoo artist from “Bogota Tattoo studio” in Bogota Colombia), was in Berlin making painful but indelible great tattoos. He works 4 days in the “Ossa38” collective. 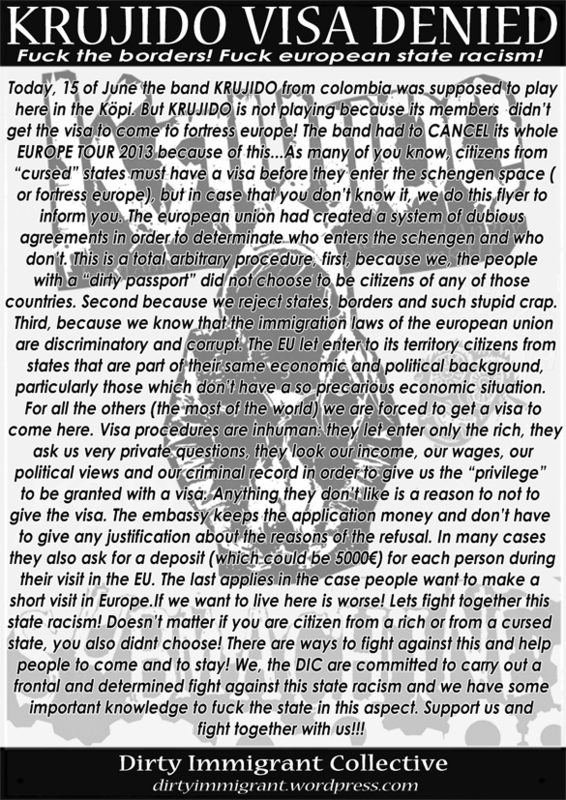 Supported by Dirty Immigrant collective. – Take the streets or F.O.A.D!! 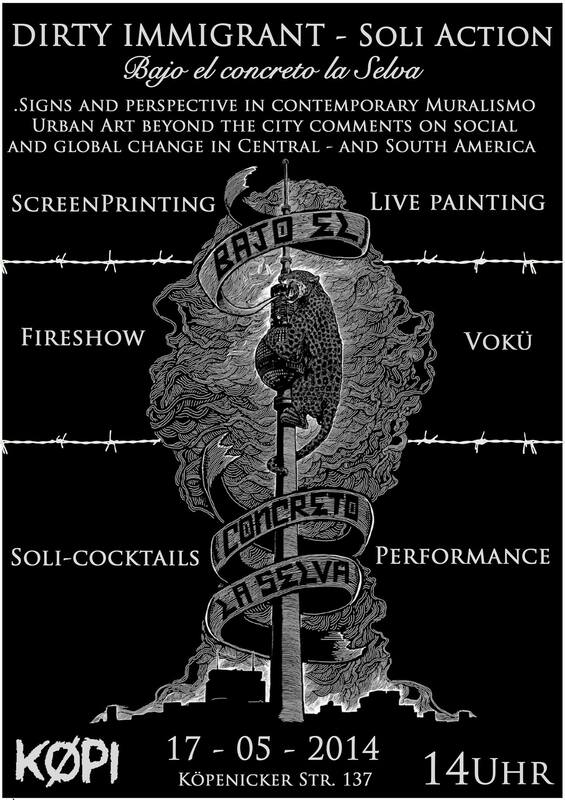 14 Marz 2014: 1st, Dirty Immigrant Fest Bogota-Colombia: A collective action/fest we organize with help of different groups and collectives of the city. There was vegetarian food by “Billares Lonchis”, Screen Printing action by “Urban Dogs” and “Rat trap”, Punk & Rap concerts of bands like: Secta Suicida + Ginger y Los Tóxicos + A La Intemperie (H.C Rap Ciudad Bolivar) + Future is Black. Also we have a fair of independent labels, distributors and publishers, were was more than 30 different collectives participating, like: La Ramona Proyectos Espacio Cientouno, S a R C O F a G a, Ambidiestro – Taller Editorial, Abisal Colectivo, Ramón Discos, Maldito Sudaca, Talk is Cheap recs., The Return Recs., NxOxD.,Subsistencia Crust Distro, Narcosarcasmo, Sin Fronteras Discos, Step Down Recs, Colmillo Zines, Distribuidora Libertaria Rojinegro, Area19, Kirius Ciudad Bolívar, grupo Regálalo, Fanzine Esto aun no temrina, Underground, La Valija de Fuego, JOYA junto con Saga Uno, Bogota Tattoo, Discos Muertos, Volketa Blogzine, Straitjacket Workshop, Feria Anarquista bta, Kipo Estudio, Toxicomano Callejero, ect. After all we have an afterparty in a place call “ASILO BAR“. Were we have dj’s that paly Rock‘n’Roll, New Wave, Postpunk & Metaldisco, Punk Classics, and lot of drinks. 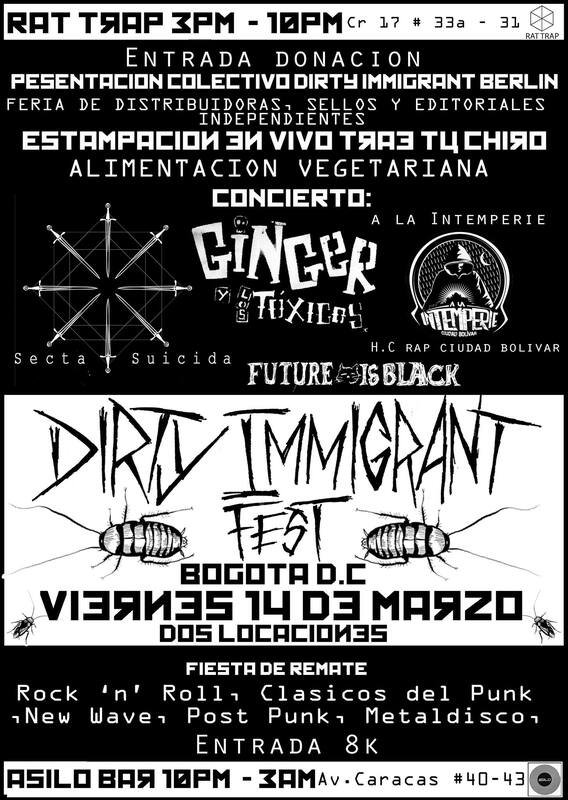 Great experience, and we hope to organize each year this Dirty Immigrant fest in Bogota Colombia. Supporting it you’ll support the lokal scene. 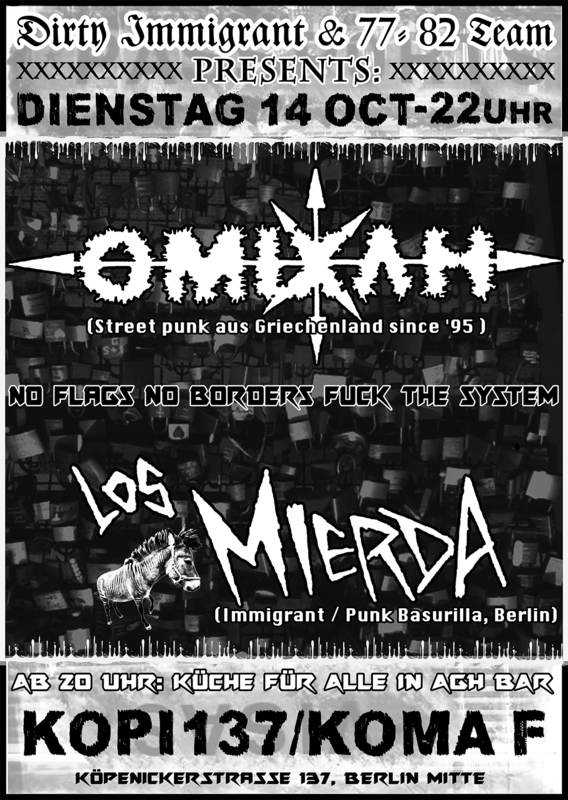 Soon more information about the Dirty Immigrant Fest 2015. 4 December 2013: Punk H.C/ Punk Konzert in Köpi/KomaF. 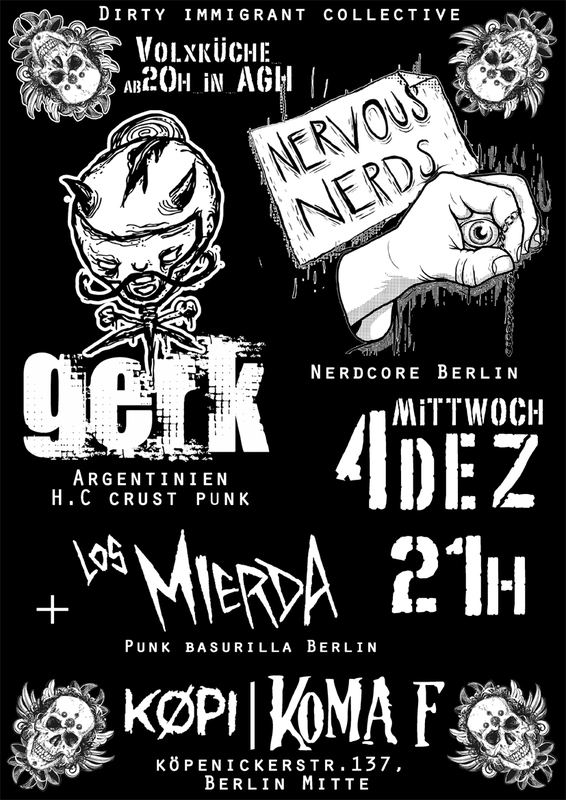 GERK (Argentinien H.C crust Punk) – Nervous Nerds (NerdCore Berlin) – Los Mierda (Punk Basurilla). 26 October 2013: SoLi PaRty for coLlektiVes in tHe tRopics by The Dirty Immigrant Collective!! 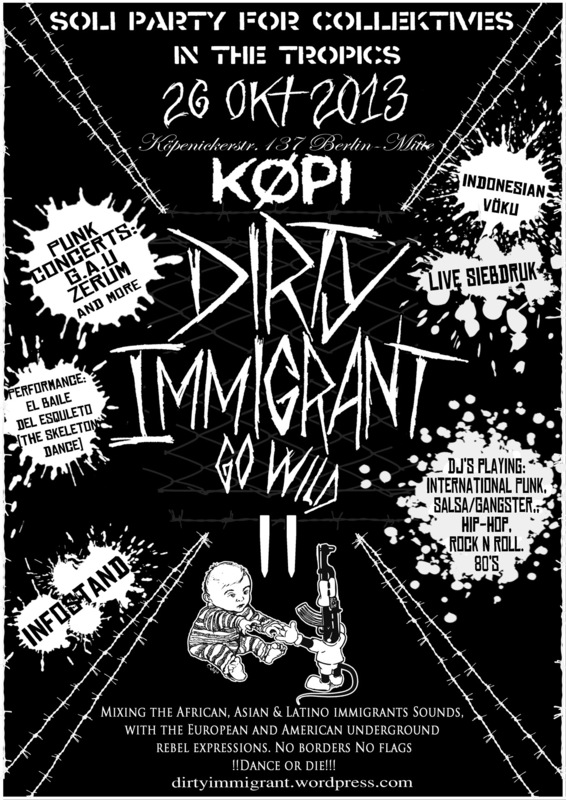 There will be Indonesian food, Dirty Immigrant soli-Info-stand, live screen printing table ( Bring your t-shirt), soli-drinks such as pfeffis and our super spicy mexikaner! and Dj’s (metal dance hits such as black sabath n motörhead, punk, postpunk, latino music, slasa, cumbia, corridos…. ) Dance or Die!! The money go to support different autonomous projects in third world countries, like it is; Indonesia & Colombia. Follow the Link: ! !Projects we support!! After some lazy time without updating our page; now we come back with new information, activities and future actions. We’ll try to keep updating the page more oftenly. 17 August 2013: CONCERT. “INFESTO” (H.C punk / Medellin Colombia) & “Jenkem Warriors” (Oslo Punks / Norway). 21h: Volksküchen (people’s kitchen) “tropical food”, Dirty Immigrant Infos-stand & live screen printing (bring your t-shirt), 22h: Concert starts.After; Salsa, Hip-hop, Rock ‘N’ Roll, international Punk party at the AGH bar. In the last months we have organize various actions. Like concerts, party’s, live screen printing and Info-stand. Our refugee sisters and brothers are striking and it is our obligation, as immigrants or european citizens to support them! We should never forget that we are in a privileged situation compare to them. Many of them have escaped states or totalitarian regimes where they life were in danger, many of them were labeled as political or military target, and they come here to look for relief but instead they have to suffer the racist discrimination of the european authoritarian regimes! every control of migration is racism and xenophobia! their struggle is our struggle! for a planet where there is no such thing as States and borders, where every person is free to choose the place where they wanna live and built with people of other and similar origins a free world. total support to them! music: INTERNATIONAL-PUNK / BALADA GANGSTER. 20h, Short films from Colombia. We will show a number of actual short films from independent Colombian filmmakers about the social and political situation in Colombia and also some “arts stuff”. Discussion about them could take place with and between some beers… Later we will play some Colombian punk hits at the bar. There is a smoker’s corner but please don’t smoke anywhere. 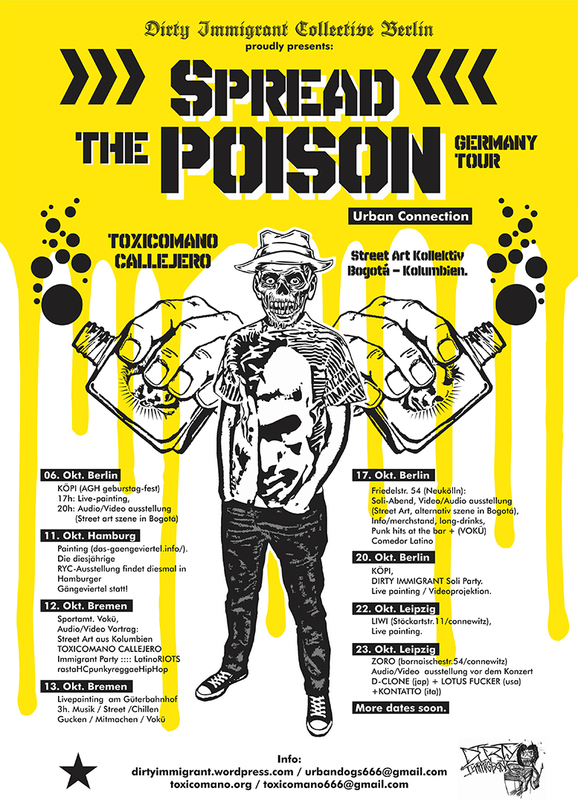 DIRTY IMMIGRANT and TOXICOMANO CALLEJERO collectives; wanna say thanks to all the people and collectives in; Berlin, Bremen, Leipzig and Hamburg, that support and made ​​possible the “Spread the Poison” tour. INFESTO- Punkband aus Medellín, Kolumbien, von 1991. Sie hatten damals nur ein Demo aufgenommen, und sich dann irgendwann aufgelöst, um die Stadt zu verlassen. Die Suche nach einem anderen Leben fernab vom gewaltvollen Medellín am Ende der 80er Jahre führte sie zu einem Ort namens Capurgana,direkt am Atlantik. 18 Jahre später wurde die Reunionbeschlossen, um endlich ein Album aufzunehmen. DIY und mit vielen Musikern aus der alten Punkszene zusammen. 2012 auf Tournee durch Europa!